Popular battery for FPV racer racing quads like the Lumenier QAV250, Immersion RC Vortex Race Quadcopter and FPV Model Racing #7 Racer. Get more power and flight time out of your 250 sized FPV racing drone. 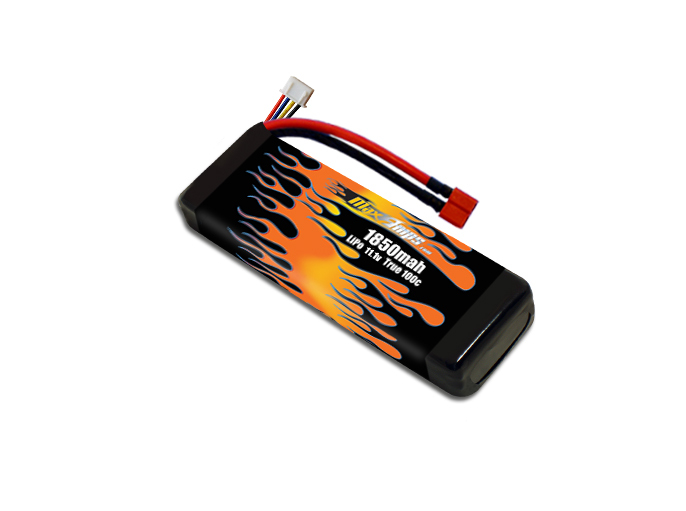 This 3S 11.1v battery holds higher voltage under load and gives you the longest flight time of any 1850mah battery we have tested for 250 sized FPV racing. The ultimate upgrade for your brushless Axial XR10 or Associated SC18, RC18B2 and RC18T2. This pack will work pefectly with no modifications required. By far One of the best batterys ive used and shipping was fast and i get hours of use on this battery on a single use and Maxamps has the best customer service ive witnessed. Im officially big fan of maxamps. Is a fantastic battery and functions as expected. The biggest plus is the experience with the company should you need them. Very understanding and pleasant to work with.